Our tiny house trailers are the rolling foundations of out tiny houses. The trailer is crucial to the integrity of the entire structure. Everything built on top depends on the structural integrity, suspension and vibration handling, and weight balance of tiny house trailer. When Jesse started Tiny Idahoms , the first thing he had to figure is where to get the trailers to build on. He looked into re-purposing a regular RV trailer. 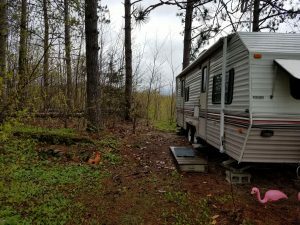 He quickly realized that there is a tremendous amount of work getting the trailer ready to build on, and when you’re done you still don’t have a trailer that was built for a tiny house RV. 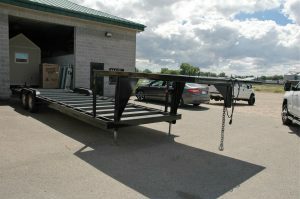 Next he went to trailer manufactures to have the trailers custom made for him. This was an improvement, but the manufactures primary experience was in building cargo trailers and equipment hauling trailers. It’s just not the same thing and Jesse still wasn’t getting exactly what he was looking for. To solve the problem of finding the perfect tiny house RV trailer, Jesse started an in-house partnership with highly experienced welders and metal fabrication designers. 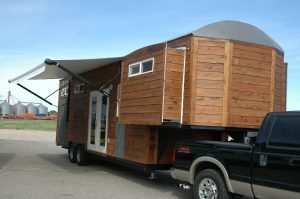 They set out to design a trailer that has the sole purpose of being the perfect mobile foundation for a tiny house on wheels. At Tiny Idahomes we build all our trailers at our location and your safety is our first concern. We are a National Association of Trailer Manufactures (NATM) certified trailer manufacturer. NATM is dedicated to improving trailer safety. 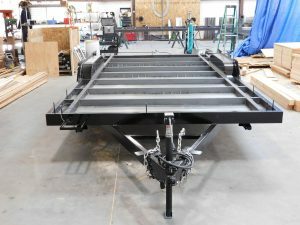 One way this is accomplished is through a mandatory Compliance Verification Program, requiring all Regular members (trailer manufacturers) to verify they have the manufacturing processes in place to build trailers that meet Federal Motor Vehicle Safety Standards (FMVSS) and industry best practices. Of course we highly recommend our Tiny House products. Building a truly livable tiny house is not easy. We can save you a lot of time and frustration by building it for you. We do understand there is a big part of the Tiny House Movement centered on building it yourself. It can be a labor of love and the experience of building can be a big part of it. For these people we offer our purpose built Tiny House Trailers for sale. The trailers we offer for sale are the exact same precision built tiny house trailers we use as the foundation for our own Tiny Homes. You can check out prices and specifications on our Tiny House Trailers Page. We can customize your Tiny House RV trailer to meet the requirements of your build. You can specify axle weight and axle position as long as it meets NATM requirements. All our trailers have an 8′ wide deck and are 8’6″ to the outside of the wheel wells.. We built tow-behind trailers in lengths from 20′ to 28′. This the buildable length; the tongue adds a few more feet. 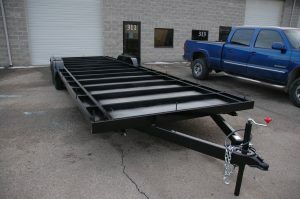 We make gooseneck/5th wheel trailers in 34′ and 40′ lengths. 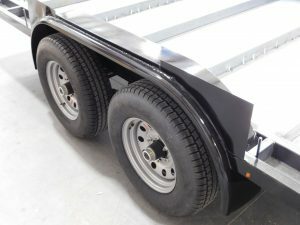 Our trailers are constructed with 2” x 5 “, 1/8”thick rectangular steel tube main frame and 2” x 5 “ , 3/16” tongue and rear bumper. We use only heavy duty epoxy based primer and paint to provide extremely long lasting corrosion protection. 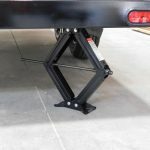 We weld in 1/2” steel house anchor bolts 6” from the corners and ever 4’ in between to securely fasten your house to the trailer. For safety we include high quality trailer brakes with a breakaway system. Leveling jacks are welded in place at all four corners. 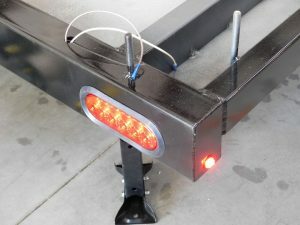 We use sealed LED break/running lights and the trailer is prewired for clearance lights, front and rear. Every trailer includes AC, battery and propane mounts. Fenders and wheel wells are a common point of corrosion on the trailer and water damage to the house so we take special care in this area. The wheel wells are sealed, inside and out, with polyurethane sealant in addition to the epoxy paint and primer. We weld on a water skirt to the upper side of the fenders to prevent water from penetrating the house. Another feature you won’t find everywhere is the bottoms of out trailers are covered with 24 gage galvanized steel sheeting. This protects the underside of you tiny house from damage, moisture and mold. It forms a nice dry chamber to hold the insulation for the underside of your tiny house RV. 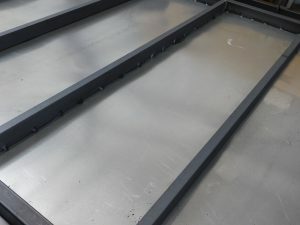 Another advantage of the galvanized steel bottom is protection from rodent intrusion. Mice, wood rats, and pack rats invading RVs and tiny houses are a very common problem. For the last six or seven years my sister has been telling me about her battle with mice. She has a medium sized travel trailer parked on her property in Vermont. It’s on o lovely spot with a beautiful view and she uses it mostly for extra guest accommodations. It didn’t take long after the trailer arrived for the mice to move in. Let the battle begin. From the inside she has tried snap traps, glue traps, poison bait. From the outside she has tried crawling under and stuffing crevices with steel wool, calking, patching, anything to try to block their entry. No matter how many she dispatches, no matter how she tries to block them, they keep coming back and they keep making more mice. A couple of weeks ago she told me that she surrenders; the mice win. She is giving up and getting rid of the trailer. If she does replace it, it will be with a Tiny House built on one of our tiny house trailers. Mice and wood rats are smart, tough, and persistent, but they can’t chew through 24 gage steel. If you’re building a tiny house on wheels, you have lots of options of what to build it on. You are going to invest a lot of time, effort, and money on your project, so don’t build it on an uncertain foundation. This is probably the most critical decision you’ll make in your build. Look around, compare, I think you will see we offer a very high quality product at a very reasonable price. We understand tiny house trailers because we build tiny houses. The quality of our product is built on the quality of our trailers. Can ya’ll build a bumper pull that is 10′ wide by 32′ long. I like all the little details your trailers have, I’m just looking for one a little wider and longer. We can do a trailer frame that size, but if you want a completed tiny house we cannot build one to those specifications due to RV codes and regulations. Hi my names Larry I’ve been looking into tiny homes and have been looking for the perfect trailer. Was wondering if you could build what I have in mind and what would the cost be for the trailer. 38 ft long 9ft wide with a triple axle nongooseneck.